The announcement of the creation of an Indigenous Council of Government (CIG), on the 1st of January this year, has generated a great deal of debate in the Mexican Left and excitement in the international ranks of the Sexta. Indeed, the debate has been underway, in parallel to the consultations in 523 indigenous communities, since the proposal was first made by EZLN and the CNI (National Indigenous Congress) during the first half of the 5th CNI, in October last year. Here, we consider some of the reactions to the proposal and its implications in the wider context of the Mexican left. In order to locate the proposal in the broader landscape of political struggle in Mexico, we must first establish the historic relationship between the CNI and EZLN. The CNI is a transitory body; it has never existed permanently, but rather in the moments its delegates have come together. The first National Indigenous Congress took place in 1996, when, in the midst of debating the San Andrés Accords, with Zedillo’s government, the Zapatistas called the different indigenous peoples of the country together to share the progress of this crucial dialogue with the State about indigenous rights. It enabled the revolutionary group to adopt a more representative posture, in so far as they were arguing for indigenous rights, not Zapatista rights. Ten years later, in 2006, the CNI met for the 4th time, in San Pedro Atlapulco, State of Mexico, where it announced its affiliation to the Sexta. The Sextathe colloquial name for the extended community of Zapatista supporters and associates in Mexico and the across the world, which originated in 2005 with the release of the Sixth Declaration of the Lacandon Jungle. The San Andrés Accords remained, and remain, unfulfilled. In October 2016, ten years after they joined the Sexta, the CNI met once more. Again, the Zapatistas would play an important role. On the 13th of October, the congress decided to adopt the Zapatistas’ proposal to form an Indigenous Council of Government, led by an indigenous woman, who would run as an independent candidate in the 2018 presidential elections. Between October and December last year, the proposal was up for debate in indigenous communities across Mexico, before delegates met again to report back. The significance of EZLN for the CNI and the over 60 indigenous peoples in Mexico can be summed up in the words of Álvaro Sebastián Ramírez, a political prisoner who wrote in an open letter to the CNI and EZLN, that the colonisers “may have chopped down the trunk of our tree, but they couldn’t pull out its roots, and it began to sprout again with the Indigenous Uprising of the Zapatista Army of National Liberation”. So, it’s the eve of 2017, Trump is soon to be inaugurated and Brexit is on its way; from where we’re sitting in the UK it seems this year is already destined to turn politics as we know it on its head. With that in mind, this unprecedented event in Mexican politics doesn’t seem quite so incredible. The so-called ‘post-truth’ age might actually just be the revealing in the West of “Democracy’s” longstanding shortcomings, which in Mexico they know only too well. Indeed, that is part of the drive for this new strategy of those from below; Trump was hardly mentioned while I was at the Zapatista science conference ‘ConCiencias’ and surrounded by supporters of the Zapatistas and the CNI over Christmas, which I think says something about the distance of the alternative left from mainstream Mexican politics and the absence of the state. The moment was marked by the oppression of indigenous environmental defenders, the eviction of autonomous cultural centre Chanti Ollin in Mexico City and the challenging, inspiring dialogue between the Zapatistas and academics like Kirsten Vogeler and Pablo González Casanova, and community science projects like Colectivo Alterius, in ConCiencias. On the 1st of January 2017, with all of this and more in the background, the CNI took centre stage and voted in the proposal. For those who followed the Otra Campaña (Other Campaign) in 2005/6 (the first call for Mexicans to think outside the political box, embodied in a nationwide consultation by the Zapatistas that ran parallel to the 2006 general elections), this new proposal will set some bells ringing. It will also flag up some pretty fundamental differences. Didn’t EZLN always claim to be against participating in the electoral process? Didn’t they adopt the poignant slogan of a collective of the Sexta, ‘Our dreams don’t fit in your urns’? Haven’t they always insisted that they will not become a political party? Yes, all of this is still true (although John Gibler writes that the Zapatista position on abstention has been treated with carefully chosen words). That’s why it is so important to recognise the germination of this proposal as a collaborative effort “EZLN–CNI”, which is ultimately to be spearheaded by the CNI not EZLN. Members of the collective Indigenous Council of Government will be elected through a consultation in all of the communities who send delegates to the CNI, including the female spokesperson. She will run as candidate in the elections because the system demands individual candidacy, but ultimately, and crucially, she will be representing the collective body; and if elected, Gustavo Esteva writes, the council as a whole must undertake the mammoth task of dismantling the state apparatus. But the proposal is about more than the 2018 presidential elections. It is challenging Mexicans to come together and struggle for freedom side by side with the 16 million indigenous people of their society, giving them a bastion around which to organise, a common purpose that will unite them, a purpose that neither beings nor ends in those urns, but which, as Josefa Contreras so astutely points out, is a “direct confrontation with an asymmetric political logic” (Ojarasca, La Jornada). Of course, the leader of recently-formed leftist party MORENA, the Movement for National Renewal, the self-professed ‘hope of Mexico’, born out of the 2006 left-wing coalition for the presidency, isn’t a fan. Andrés Manuel López Obrador, quickly denounced the proposal, accusing EZLN and the CNI of playing the government’s game, and highlighting their inconsistency, since they detracted from his campaigns in 2006 and 2012, encouraging abstention from what, despite the end of single-party rule in 2000, is still widely considered to be the electoral farce. But since the last general elections, Ayotzinapa has shaken civil society to its core and put a spotlight on the chronic, systematic human rights abuses of the Mexican state. Political observers said it was the straw that broke the camel’s back, causing the Mexican public to explode out onto the streets in protests that reached the 10,000s in November 2014. But it didn’t, and the impunity has continued. The teachers’ strikes against the supposed ‘educational reform’, which many maintain is really a neoliberal and neocolonial labour reform led, in June 2016, to the death of at least ten people (although some sources say eleven) in a confrontation between police and protesters in Nochixtlán, Oaxaca, reminiscent of the oppression of mass protests in the same state in 2006. Three months before Ayotzinapa, 22 civilians were victims of extrajudicial execution by members of the army in Tlatlaya. The community of Atenco, where 2 young men were killed, 27 women raped and over 200 locals injured and arrested in 2006 continues to resist the building of a new airport on their land and state actors continue to commit acts of sexual violence. This incident was what put the breaks on the Other Campaign, as adherents rushed to protect the community in resistance. Political commentators reason that the new proposal will undermine Obrador and MORENA. The counterargument, of course, is that any change brought about through MORENA would be superficial. For various historical reasons including the collaboration of the institutional leftist party the PRD with the PRI and PAN in governorship coalitions and corruption scandals, most activists I’ve come across from within the alternative left consider all professional politicians to be as bad as each other. An esteemed Mexican intellectual from the Sexta told me the same, that to save the future of the country the people must look towards a completely new avenue of change, one that comes from their millenary cultural heritage. Seemingly embodying a middle ground, the poet and activist Javier Sicilia recently called for a Popular Front for 2018; the coming together of various leftist elements in Mexico ranging from the solidly institutional (Cuauhtémoc Cárdenas – first leader of the ‘leftist’ institutional party, the PRD, in 1989) to the openly anti-systemic (EZLN) and including potential brokers between these two poles such as migrant advocate Father Alejandro Solalinde. Obrador would neither lead nor not be excluded from this front, Sicilia insisted, tapping into concerns about Obrador’s charismatic leadership. The charismatic leader model of populist leftism has come under significant critique recently, in cases like Venezuela and Bolivia, and it is important to recognise just how much the EZLN-CNI collective governance proposal veers away from this path, proposing a much more fundamental change to the system than MORENA does. But although Sicilia evoked similar collective ideals, he made no explicit mention of the EZLN-CNI proposal. 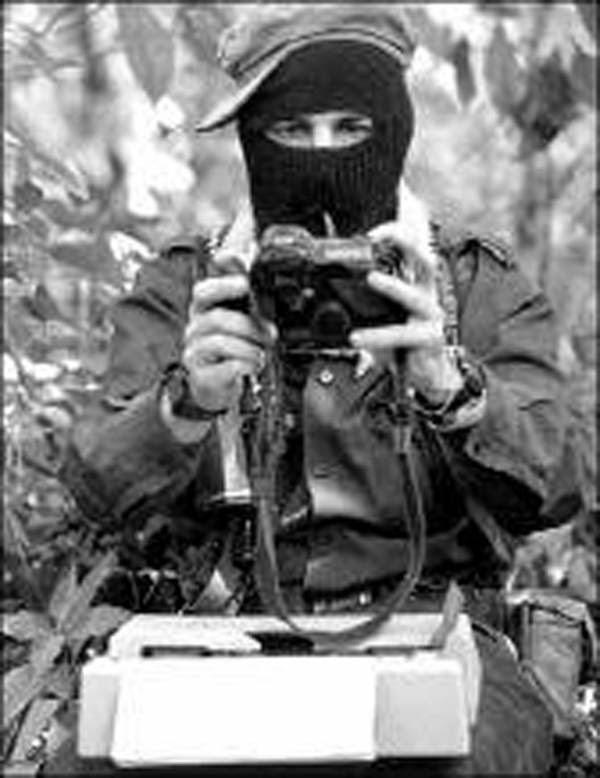 It may be early days to be analysing the response to the EZLN-CNI proposal; the candidate to lead the CIG is to be chosen and announced in May, which I imagine will provoke further comment and debate. One thing that did jump out at me while researching this article was the lack of coverage of this historic event in the English speaking international press (the Guardian, BBC, NY Times and Washington Post haven’t run articles on it for a start) – everyone’s news on Mexico has been Trump-related. The EZLN-CNI proposal is a world away from mainstream politics; will it galvanize interest and support from across the political spectrum or remain in the network of resistance from below? We will have to wait and see.